The explosion of social media has led more and more people to share their personal news online. Now, the newest development is that the news these people are seeking and sharing has gone beyond their personal worlds and into world headlines. Today, social media sites have become popular places to keep up with the latest news, according to the Pew Research Center. But since the friendly face of social sites is much different than the serious tone of news outlets, how is this affecting the way social media is used for news? Read what the Pew Research Center discovered in its investigative report. Social Media as a Link to News – While once mostly used for sharing personal news, Facebook is now used by 30% of U.S. adults for finding headline news. But Facebook isn’t the only social link to news. Around 10% of U.S. adults turn to YouTube and Twitter to get their news. Digital in Discovery – Research shows that Facebook is a major source of website referrals for numerous news outlets. But while these social referrals may direct people’s attention toward the news sites, these socially referred viewers tend to have shorter attention spans and don’t stay as long as readers who arrive at these news sites directly. This may be because social users are only interested in a particular story that led them to the news outlet, while direct news seekers are more interested and inclined to read many more news stories. Despite the shorter visits of social referrals, any increase in traffic is good news for news sites. The Content People Follow – Different types of headlines turn heads on social media sites. Entertainment news proves most entertaining on Facebook, with 73% of users regularly viewing this kind of content. And about half of all Facebook users regularly read about six different categories of news on topics from sports to health, while Twitter’s ability to post real-time news makes it a prime place for discovering and following breaking news stories. Opting Out of Opinions – While people like to look to social media to read the news that has people talking, they don’t necessarily like to talk about it themselves. A recent survey showed that people were much less willing to share their opinions about timely news on social media than they were in person. Perhaps social media has become so popular that any veil of anonymity was lifted long ago. So while social media may be a good place to read about news, many people don’t feel as good about discussing their opinions on it. So according to the latest research, social media is now making news by breaking it. 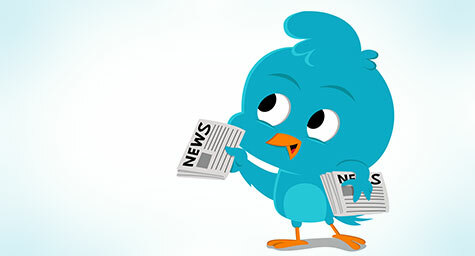 Discover what’s new and news in social media. Contact MDG Advertising today at 561-338-7797 or visit mdgadvertising.com.